1. Oolong tea requires a combination of dry rub and pack up again and again and CTN6CHT-6.0 is most beneficial to the evaporation of water tea is the tea inclusion of thermal reaction, to develop its unique aroma. Shape and color of tea can be fixed, reduce the size. 2. 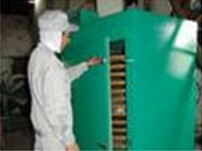 The beginning of baking: baking cage or through the appropriate baking dryer, so that the residual activity of leaf cells of further is damaged, and water is also distributed, easier to pack rub.